on what’s left of my cigarette. from blowing smoke into a child’s face. I say ‘we’. Nicole did all the hard work. I was there to offer love and support, to be a calming presence. So when she awoke one night feeling nauseous and the midwife advised over the phone to get some sleep, I led by example whilst she lay restless. Some brownie points lost there. A week had passed since our due date so the bags were ready by the door and we had ourselves a plan. Once I was awake and making myself useful it became a matter of waiting it out. Warned that many people rush in too early and find themselves waiting at the hospital for hours– we thought it best to wait it in the comfort of home. Nicole powered through and I stood idly by for near 6 hours before the contractions became more regular and intense. Arriving at the hospital we crossed the path of a new family who looked to us with a knowing smile. We were in Triage at 6am, the few nurses there were very casual, too calm, they had seen this a thousand times before. We were moved into a small adjoining side room where a young nurse asked questions to a now groaning and breathless Nicole, pacing around the room . The next nurse laid Nicole down to examine our progress when she shot us a look of surprise: we might have to have the baby here – in this small unequipped side room. Nicole manages to find enough breath to muster the words “pain relief”. Evidently it was too late. I start to panic a little though I daren’t show it as I know how precious Nicole can be and how low her pain threshold is. I held close to the nurse and Nicole as she was rushed to the ward in a wheelchair, ‎now safely in the care of the mid-wife and with the promised god-send of Gas and Air. Clamped down in-between her teeth I watched Nicole transform, I witnessed her eyes widen, her pain dissipate as she finally relaxed. This meant that I could relax. Until the pushing began. Nothing is harder than seeing the person you love in pain, knowing that you are powerless and there is nothing you can do to help. I became Nicole’s stress ball as she clenched my hand and gave her first push. “He has his father’s hair”, the words of the mid-wife as I steal the first look at my son with a full head of jet black hair. A few pushes later and finally we were all together. I was truly humbled by how Nicole had handled everything. 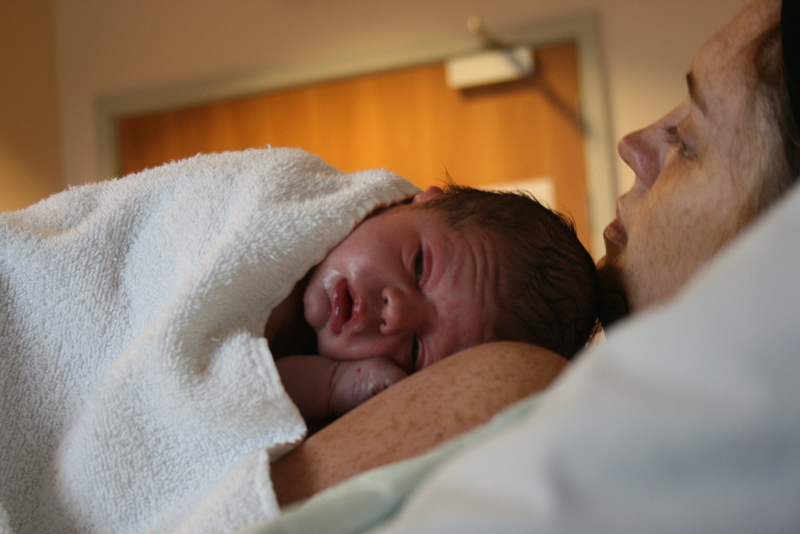 We were in the delivery room for around two hours – turns out Nicole was already fully dilated when we arrived. After cutting the cord and taking in the sight of my new family, I was then handed my son whilst some reparations were made. I was uneasy, nervous but overcome with a sense of pride, and as I sat there with him for around half an hour, all my concerns dissolved and his eventual calmness transferred to me. On our way out of the hospital the next morning we pass a quiet, heavily pregnant woman beside her doting, helpless partner. We wish them luck and the cycle continues.